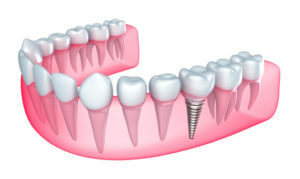 If you suffer from any amount of tooth loss, then dental implants are one of the best options for tooth replacement. Unlike other prosthetics that merely rest on top of your gums, implants are secured within your jawbone so you can smile, speak and eat without ever having to worry about your teeth slipping. Dr. Young has restored many smiles with dental implants in Manahawkin, New Jersey, and he can do the same for you! After graduating from the New Jersey College of Medicine and Dentistry, Dr. Young went on to complete a two-year post-graduate program in implant surgery and crown and bridge or denture placement over implants at the Misch Institute of Implantology. Only a small number of dentists are accepted to this exclusive program. In addition, Dr. Young is a fellow of the Academy of Oral Implantology. Thus, his education and experience make him an eminently qualified dentist to perform the entire dental implant procedure. Most people with missing teeth are qualified candidates for dental implants, whether they need one to replace a single missing tooth or several implants to secure a partial or full denture that replace more than one. However, there are some specific qualifications that must be met. First and foremost, your gums must be in good condition. Secondly, your jawbone must be strong; this means there must be adequate bone density in order to properly anchor the implant in your jaw. If you’ve been missing teeth for a while, then some of your bone tissue may have begun to deteriorate. In this case, a bone graft procedure may be necessary before Dr. Young places your implants. The entire implant process—placing the implants, healing time, and attaching the appropriate tooth restoration—can take anywhere from three to nine months. Once the process is completed and your dental implants are a natural part of your smile, you’ll need to maintain excellent oral hygiene to ensure the success of your implants. Be sure to schedule regular dental checkups and brush and floss daily. If you’re ready to say goodbye to missing teeth and hello to dental implants, contact the dental practice of Dr. Robert Young in Manahawkin, New Jersey. We are located at 1104 Beacon Avenue, Manahawkin, NJ in Ocean Acres right behind Southern Medical Center off Nautilus Drive. We’ll take great care of you! Call us at (609) 997-0615.